The 2015 TimeZone Watch of the Year finalists represent the best timepieces of the year. 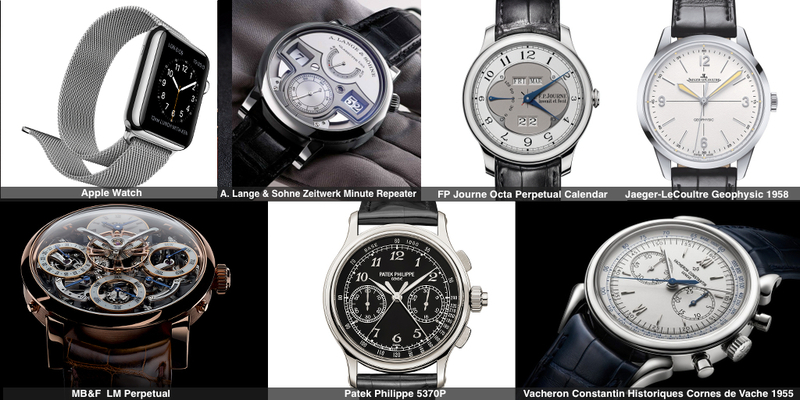 The winner is chosen exclusively by the TimeZone community, the world's largest community of wristwatch enthusiasts. Please post your vote here. 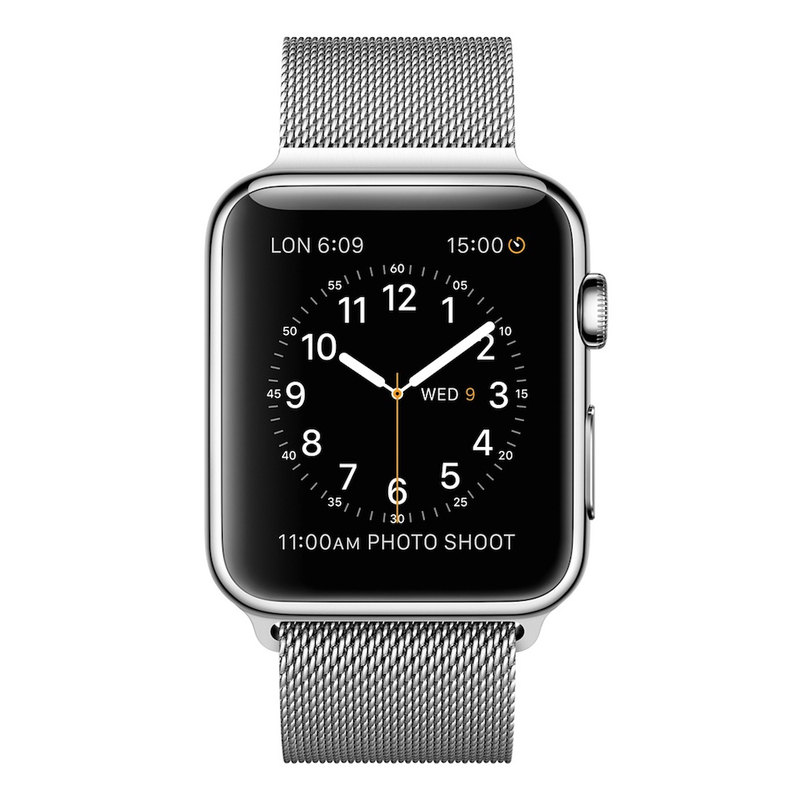 The Apple Watch reimagines the wristwatch by combining fashion, technical innovation and computing. The Apple Watch can manage and respond to notifications in a variety of ways, track daily activity, control music, receive and make calls using the built-in microphone and speaker, search for locations and receive audio cues and tactile directions on the wrist, and pay quickly and securely using Apple Pay. Meanwhile, in conjunction with your iPhone, the Apple Watch keeps precise time to within 50 milliseconds of the definitive global time standard all while delivering important information and helping perform everyday tasks. In addition to the computing advances within the case itself, Apple design innovations extend to the straps and bracelets such as release joints that simplify changing, sizing and attachment to easy tasks without tools. Traditional functions like time, moon phase, sunrise/sunset, alarm, calendar, timer, and modern functions like stock quotes, weather reports, daily activity tracker and numerous data from the App Store. The A. Lange & Söhne Zeitwerk Minute Repeater is the first mechanical watch that pairs a jumping numerals display with a decimal minute repeater. The acoustic time indication consists of a low-pitched tone for each elapsed hour, a double tone for each elapsed ten-minute period, and a high-pitched tone for each elapsed minute. Thus, the time as sounded corresponds exactly to the time as displayed. Turning the timepiece over reveals the manufacture caliber L043.5 with an improved configuration wherein the hours are sampled directly at the hour ring. The ones- and tens-minute snails are attached to two separate arbors. The nine steps of the minute snail and the five steps of the tens-minute snail are uniformly distributed around the entire circumference of 360 degrees. Thus, the struck time always corresponds to the displayed time and we hear what we see. The striking mechanism is powered by the mainspring. When the strikework is activated, the ratchet wheel is uncoupled from the winding train. This allows the ratchet wheel to drive the striking mechanism without wasting energy for the winding train during the repeater sequence. In addition, instead of the conventional slide, the Zeitwerk Minute Repeater features a pusher for activating the striking mechanism. The F.P.Journe Quantième Perpétuel with instantaneous jump presents a distinctive aesthetic in offering perfect legibility through an uncluttered dial with large apertures: two for the day and month calendar, and a large date in two windows. The instantaneous jump is reinforced by an ingenious F.P.Journe system designed to accumulate energy and release it instantaneously when the date, day or month changes; and then slow it down at the end of its route. 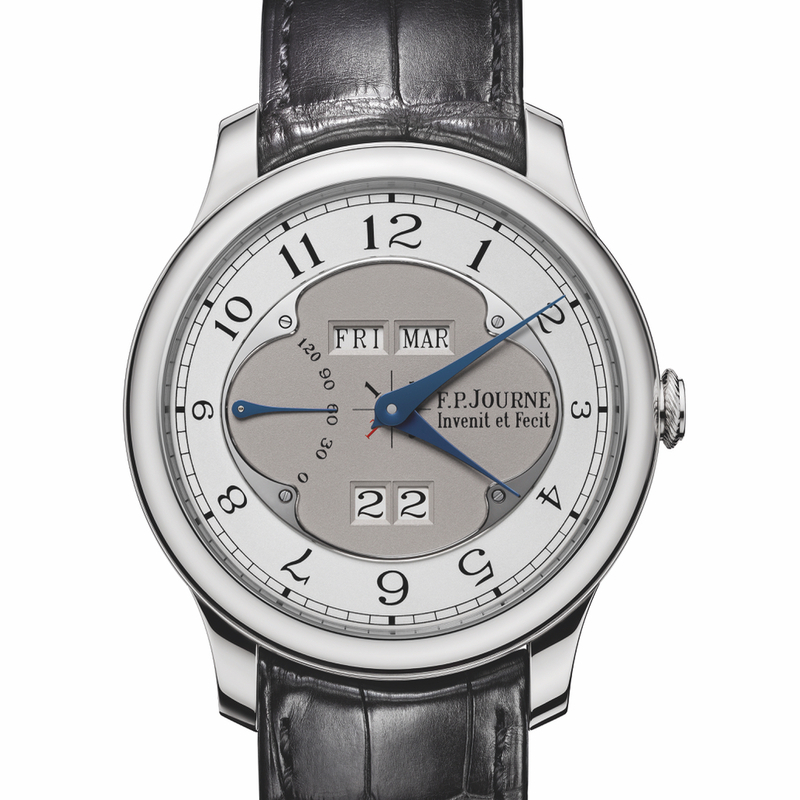 Unlike perpetual calendars that are often difficult to adjust, the F.P.Journe Quantième Perpétuel is very easy to use. All corrections are made using the three-position crown, except for the rapid correction of months, which is carried out by a protected and hidden corrector lever beneath the lug at 1 o'clock. It thus facilitates the adjustment over four years without the need for a corrector, stylus or any other tools. The months with 28, 29, 30 and 31 days are automatically taken into account with recognition of the leap years shown in the center of the dial under the hour and minute hands. The years 1, 2 and 3 are shown in black, the leap year as L (leap) is shown in red. The automatic winding movement of the Quantième Perpétuel is manufactured in 18-carat rose gold. It is constructed on the basis of the Octa manufacture calibre 1300.3, with an identical calibre leaving room to insert all the complications of the Octa line. The movement also features the F.P. Journe signature off-center rotor in 22-carat red gold that offers optimal winding of the watch for an effective power reserve with retrograde indication of over 120-hours. It winds the movement in only one direction with an autoblocant ball bearing system (self-blocking). Manufacture calibre FPJ 1300-3 automatic movement in 18-carat rose gold (4N) with off-center 22-carat gold guilloché winding rotor, 340 component parts and 37 jewels. Unidirectional automatic winding. Linear escapement 15 tooth. Chronometric balance with inertia weight. Anachron free-sprung flat balance spring. Mobile stud holder. Nivatronic laser soldered balance spring. Pinned GE stud. Barrel with slipping spring. 21,600 v/h (3 Hz) and 120-hour power reserve. Central hours and minutes, indication of leap year with centered small hand, 1, 2, 3, in black; 4 for the leap year in red. Day and month at 12 o'clock in 2 apertures. Large date at 6 o'clock in double aperture. Power reserve at 9 o'clock. 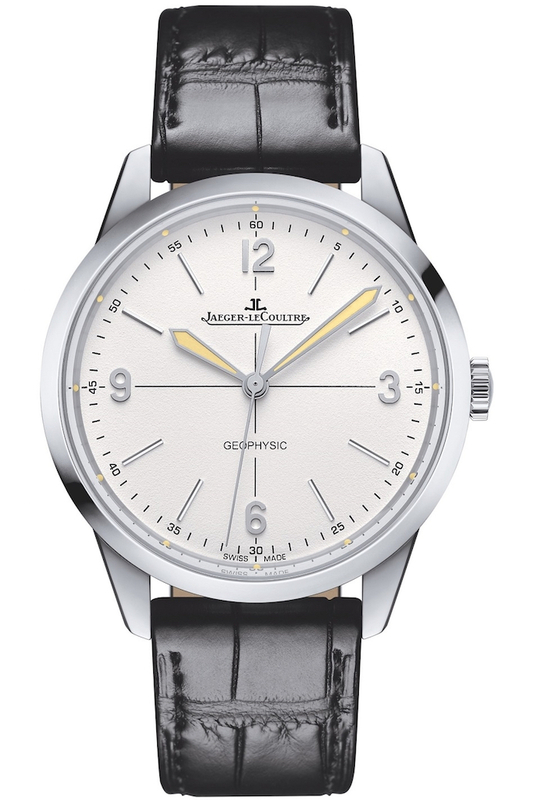 The Jaeger-LeCoultre Geophysic 1958 is a tribute to the legendary Geophysic chronometer created in 1958 for the International Geophysical Year, an international scientific project that began with Antarctic studies that officially marked the end of a long period during the Cold War when scientific interchange between East and West had been seriously interrupted. Inspired by the original calibre 478BWSbr, the Geophysic 1958 is equipped with the JLC Calibre 898/1 automatic mechanical movement contains, considered one of the most precise and reliable in-house automatic movements on the market today. The JLC Calibre 898/1 movement combines a stop second for accurate time-setting, a frequency of 28,800 vibrations per hour for high precision, a balance with micrometric adjustment by means of screws set into the rim, shock-resistance, Spyr gears for smooth transmission of torque in the gear train, automatic winding with ceramic ball bearings that require no lubrication, and a soft-iron inner case that protects the mechanism from the effects of magnetism. Bâton hands indicate the hours and minutes, and a rhodium-plated seconds hand sweeps over the grained white dial. Applied numerals and hour-markers are inspired by the layout and design codes of the historical model, and vintage-colored luminescence is applied to the bâton hands and dots facing the hour-markers around the inner bezel ring. Water-resistant to 100 metres, the solid case back is decorated with the J and L initials of Jaeger-LeCoultre superimposed on a globe criss-crossed by latitude and longitude lines. 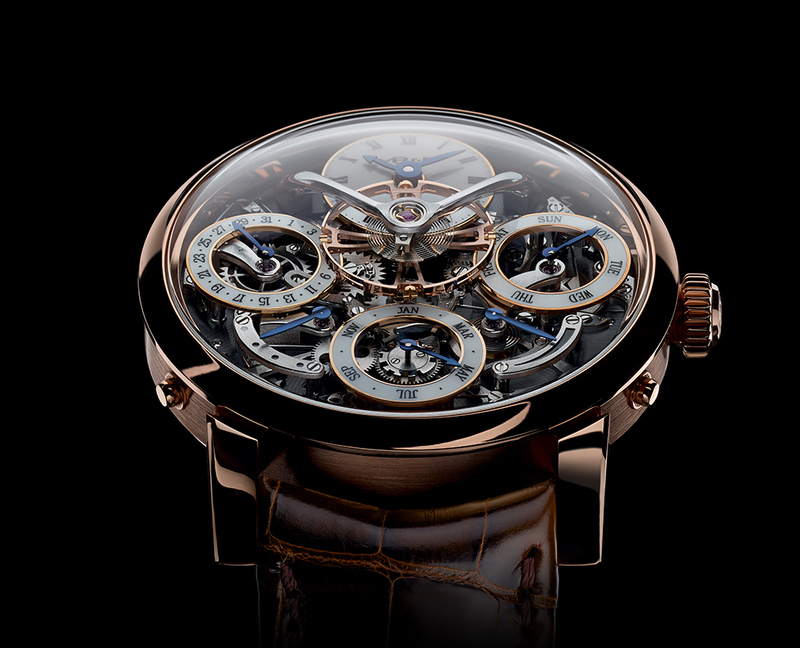 The MB&F Legacy Machine Perpetual uses a patented "mechanical processor" in lieu of the conventional grand levier (big lever) system architecture. The mechanical processor utilizes a default 28-day month and adds extra days as required. This means that each month always has the exact number of days required; there is no fast-forwarding or skipping redundant days. While the leap year can only be set on traditional perpetual calendars by scrolling through up to 47 months, the LM Perpetual has a dedicated quickset pusher to adjust the year. To highlight this technical feat, the open dial reveals the full complication and suspended balance with subdials that appear to float above the movement. The skeletonised subdials rest on hidden studs, which is impossible with traditional perpetual calendar mechanisms equipped with the grand levier. The hours and minutes are indicated at 12 o'clock between the arches of the balance. The day of the week is indicated at 3 o'clock, power reserve at 4 o'clock, month at 6 o'clock, retrograde leap year indicator at 7 o'clock, and date at 9 o'clock. Fully integrated perpetual calendar developed exclusively for MB&F by Stephen McDonnell, featuring dial-side complication and mechanical processor system architecture with inbuilt safety mechanism. 581 component parts. 41 jewels. 18,000 bph (2.5 Hz). Manual winding with double mainspring barrels. Bespoke 14mm balance wheel with traditional regulating screws visible on top of the movement. 72-hour power reserve. 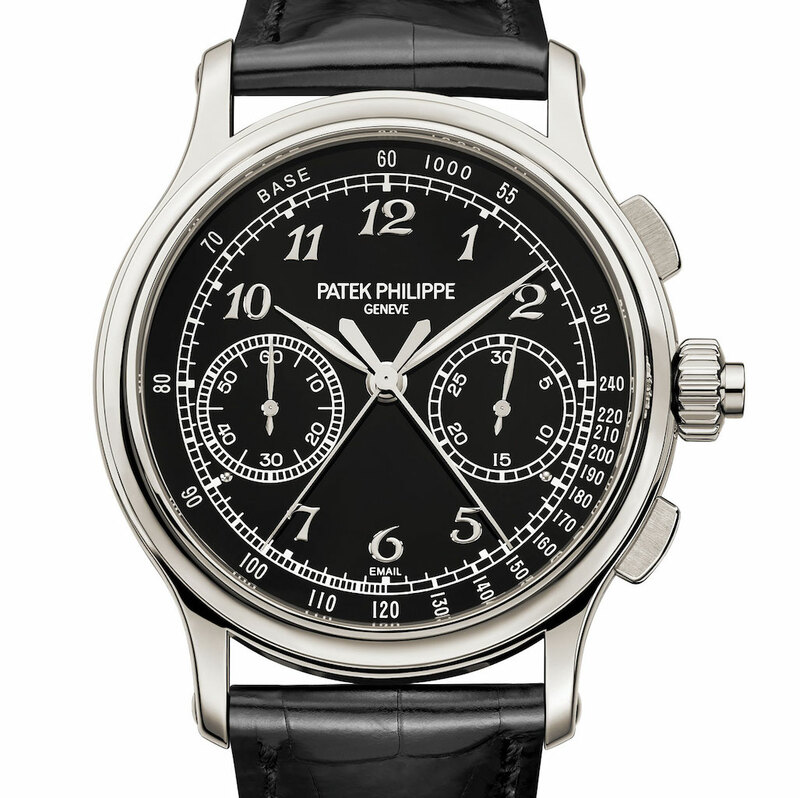 The Patek Philippe 5370P is a split-seconds chronograph with two pushers for the basic start, stop, reset functions and an additional on/off button integrated in the crown for the split-seconds function. For the first time, the Ref. 5370 incorporates the manufacture caliber CHR 29-535 PS with the addition of a newly designed isolator that uncouples the split-seconds wheel from the chronograph wheel to eliminate unwanted friction and prevent a degradation of balance amplitude while the split-seconds hand is immobilized. As well, the split-seconds lever that positions a ruby roller between two flat heart cam shoulders keeps the chronograph and split-seconds hands precisely aligned as long as they are superposed. The platinum case is manufactured and finished in-house, and set with a flawless Top Wesselton diamond in the caseband at 6 o'clock. 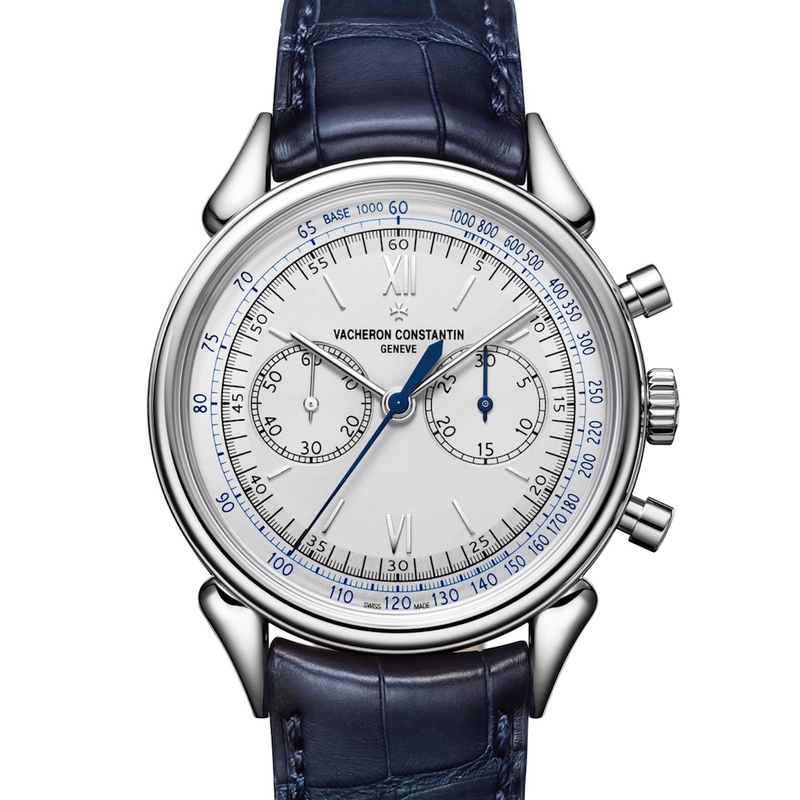 Two oval chronograph pushers are at 2 o'clock (start/stop) and 4 o'clock (reset) on either side of the new turban-style crown with integrated rattrapante button. The case lugs feature reworked flanks that merge with the case in a gentle curvature. The lugs are finished with cambered white-gold cabochons that conceal the strap bars. A solid white gold dial is the base for the intensely black Grand Feu enamel dial that is also manufactured in-house. 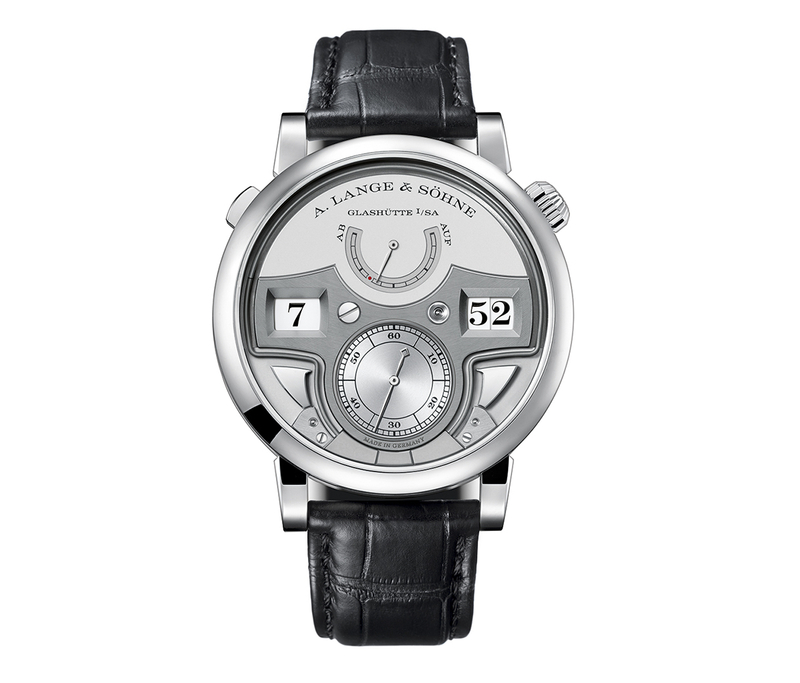 The dial is decorated with applied white gold Breguet numerals. The white gold feuille hands are treated with SuperLuminova. The slender chronograph and split-seconds hands are rhodiumed steel, and the instantaneous 30-minute chronograph counter is white gold. The scales are printed in crisp white for optimal legibility. This contemporary interpretation of the legendary reference 6087 "cow-horns" model created by Vacheron Constantin in 1955 features a hand-wound Caliber 1142 chronograph movement in a distinctive 38.5mm platinum case. The original dial layout of the 30-minute counter at 3 o'clock and small seconds at 9 o'clock is reinterpreted on a silver-toned opaline dial with Roman numerals, applied hour-markers and white gold hands. The central seconds hand and the 30-minute counter hand are heat-blued and complemented by a tachometric scale printed in royal blue. © 2016 Bourne in Time Inc.